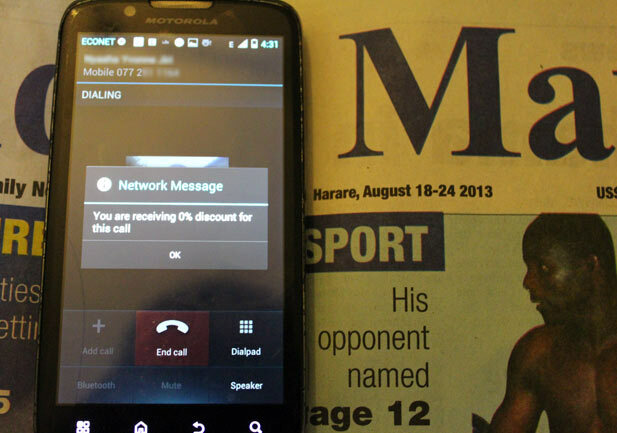 Home » Connectivity » Zimbabwe mobile wars: Has Econet really slashed calls to 10 cents per minute? Zimbabwe mobile wars: Has Econet really slashed calls to 10 cents per minute? After months of the experts in the market suggesting Telecel was slowly killing the business with all the promos, Econet pulled one last Friday we surely didn’t expect: they announced they were going for an outright unconditional price slash of 60%! Talk of pleasantly shocking. Econet even joked in the ads that no Telecel “mega promo” could match this price attack. Which led the market to speculate; if the Telecel promos were killing the Telecel business slowly, just how much was Econet going to bleed from this even more expensive price slash, and how rapid would that happen. Fast enough to impact the share price? But there’s something that we missed in the Econet announcement last Friday. The company didn’t speak of calls within the network. They carefully worded the statement to say calls to other networks would enjoy the new 10 cents per minute price. Add a missing “only” there. And to make that even less noticeable, they promised calls on the Econet network would enjoy a discount of up to 90%. Even more confusing were the Facebook ads which spoke of “10 cents a minute across networks“. Again that meant ‘only’. Other words in the statement like ‘unconditional’ and ‘When we give, we give” were thrown in there for even more effect. Even though its carrying the ‘Breaking news’ tag, you will remember this from 8 August when we wrote about an underwhelming new promo. This promo is what takes care of Econet to Econet calls. Making up for Buddie Zone, which, really isn’t is delivering the 90% discounts the ads say it’s supposed to. See this call we made as we were writing this article for example; 0%. Basically, if you are an Econet subscriber, to call other Econet numbers at 10 cents, you have to buy voice bundles first otherwise your calls will default to Buddie Zone discounts which are hardly predictable. So, just how much revenue will Econet bleed from this? Well, the effect we’d all imagined after Fridays’ announcement may not be as big, but bleed they will. There’s the 5 day bundle expiry period that protects Econet from a real price slash but the jury is still out on just how much that means. Data revenues are nowhere near compensating for the lost voice dollars so we should certainly expect a knock come announcement of results. Has Econet really slashed calls to 10 cents per minute? Yes, and No. Yes carefully worded like a legal document. What a waste… Personally I didn’t mind the tariffs they where charging… I don’t call much using Econet anyway, I’m happy with Africom for my calls. But confusing and exploiting the customers is pure devious and a terrible move. If Telecel really wants to win this war, they better increase their capacity and quality of service as they will definitely benefit from Econet’s blunder. Legal jargon & trickery doesn’t work here. No one will bother taking anyone to court. But will definitely dump their lines. Telecel is gonna see a good surge in ARU as opposed to Econet. Tested Econet bundles and was disappointed. If you convert your air time to daily bundles you get call minutes and Buddie Zone discounts wont work for you. Buddie Zone only works if you have airtime in your account not converted to these promotional bundles. I subscribed for a $1 bundle and was credited 10 minutes and my normal air time account was on $0.00, made a call around 10pm, a 90% Buddie zone discount showed up before the call and exactly after 10 minutes my bundle minutes were over and the call was cut. If I had not converted my airtime to bundles, was supposed to talk for more than 44 minutes with a 90% Buddie zone discount. Exactly what happened to me, these guys are a rip off…….. I have always noticed that Econet promos never lack caveats. Econet seems to put profitability and revenue maximization before subscriber appeal. Look at the loyalty points promo, you had to recharge about $50 to get 500 points, which you would then redeem for $1 (either for SMS, data or voice), seriously?? recharge $50 to get $1?? And I was told by an insider that you needed to accumulate 12000 points to redeem a handset (probably worth $50 or so), that’s about $1200 to get $50! Now history has repeated itself again, we are now being charged more to call our own buddies than to call other networks, this happened again about a decade ago when Econet reduced tariffs to other networks, giving some (again complicated) explanation saying it was more expensive to connect two Econet subscribers than to connect, say, an Econet subscriber to a Telecel one. This is history, but it definitely shows what kind of network Econet is when it comes to tariffs and promos. When Telecel give, they give. I mean, surely getting 200 minutes for $1? As opposed to Econet giving you 10 minutes for $1? Who’s the bigger giver here? Be real give people meaningful promotions not this or the buddie zone as it is so called. I prefer Telecel real value for money you don’t need to wait and guess its ipapo ipapo. Until you put your subscribers first before your appetite for huge profits then I tell you might as well be sinking your own ship. History will tell. Where is Potraz as a regulator in all this? Its job is to make sure that people clearly understand what is on offer through vetting ads and keep these telcos under leash. agreed! overseas (or outside of Zims) this can be classed as false advertising. corporates actually get sued over these kind of things! The disqus commenting system is not compatible with opera mini yet more than 50% of Zimbabwe internet users use opera mini to browse. Whats the point of putting disqus on this site. Very true. We are working to change that. And thank you for the continued feedback. I don’t know if @sucky:disqus’s complaint is a common one but I happen to like the Disqus system. If I recall correctly a previous attempt to lose it wasn’t a very popular move! Let the mobile guys use Facebook, I say. Do A to get B and then C will work. And as this is a promo, it means it will end soon (or later?) and yes another more complicated promo will be launched. Why do I get the feeling these promos from Telecel and Econet are being ripped off from the “same”/similar promos in SA? econet is very greedy they will never have a promotion where they bleed.never, never, never. I’m not greedy, but I wouldn’t deliberately do something that would make me bleed either.